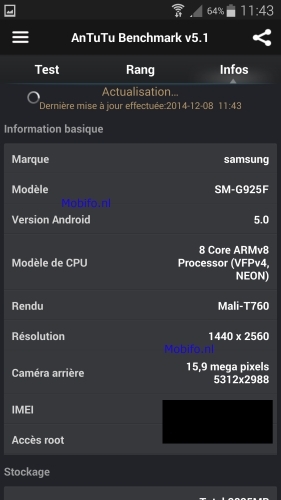 We have recently seen a leak of an AnTuTu benchmark screenshot that displayed the specs of the upcoming Galaxy S6. Today, another such screenshot has emerged with slightly different specs. As before, the new screenshots shows the phone having a QHD display, with an octa-core CPU and Mali-T760 GPU, which according to the previous screenshot is the upcoming Exynos 7420 based on 20nm process and 64-bit architecture. The phone was also said to have 3GB RAM. The difference here is that while the previous screenshot claimed a 20 megapixel rear camera, the new one mentions 16 megapixel. Perhaps these are two different variants of the phone meant for different markets (the Korean models usually have better specs) but we'll have to wait and see to find out for sure. Must be at 5.5 or it's disappointing. they like to make bricks not phones. how can I people have a 5.2 inch in his pocket? :) it's hilarious to wear it near your year.